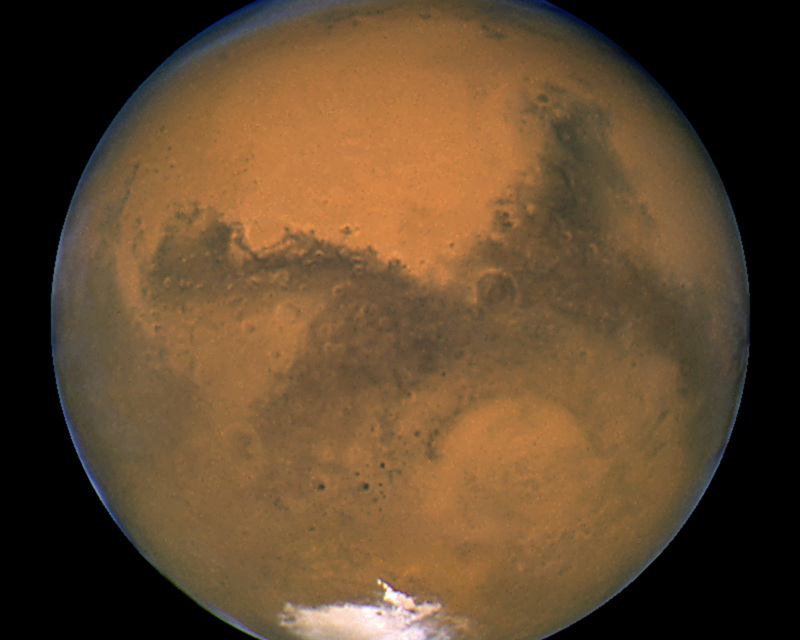 Taking advantage of Mars's closest approach to Earth in eight years, astronomers using the Hubble telescope have taken the space-based observatory's sharpest views yet of the Red Planet. The telescope snapped these pictures between April 27 and May 6, 1999, when Mars was 87 million kilometres from Earth. 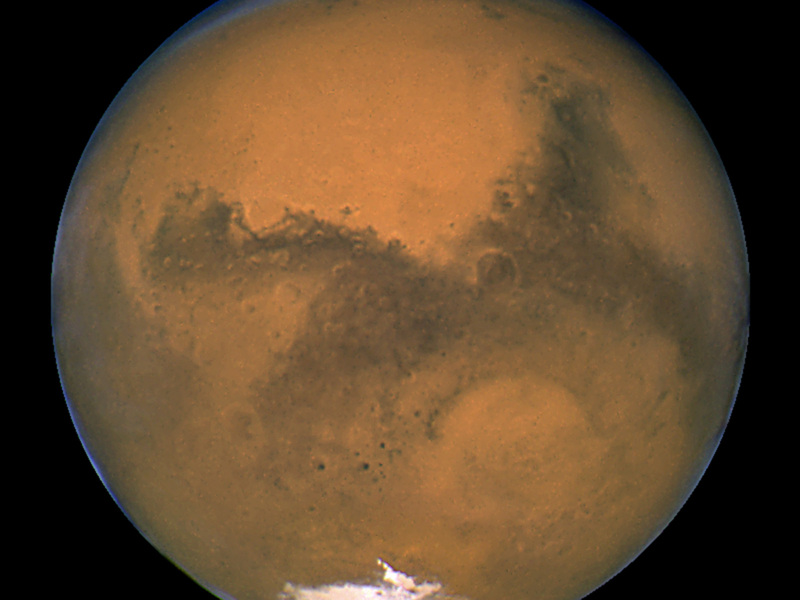 From this distance the telescope could see Martian features as small as 19 kilometres wide. This view depicts the planet as it completes one quarter of its daily rotation. Below and to the left of Acidalia are the massive Martian canyon systems of Valles Marineris, some of which form long linear markings that were once thought by some to be canals. Early morning clouds can be seen along the left limb of the planet, and a large cyclonic storm composed of water ice is churning near the polar cap. 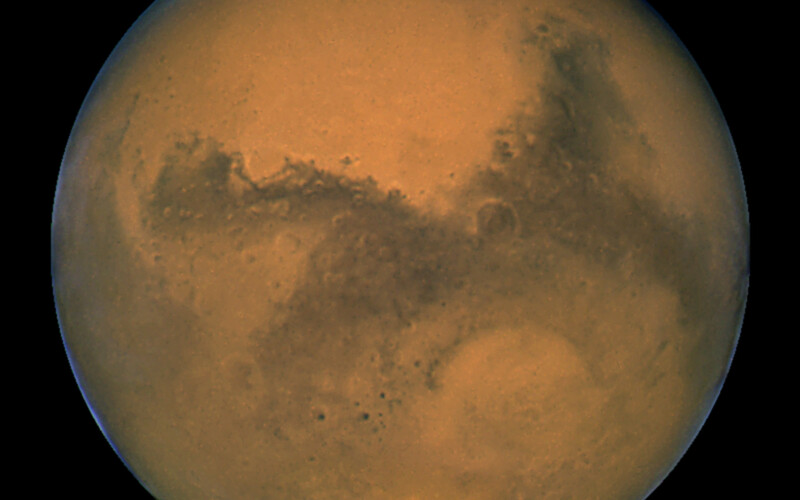 The red colour of the martian surface is due to 'rusted' iron-composites. 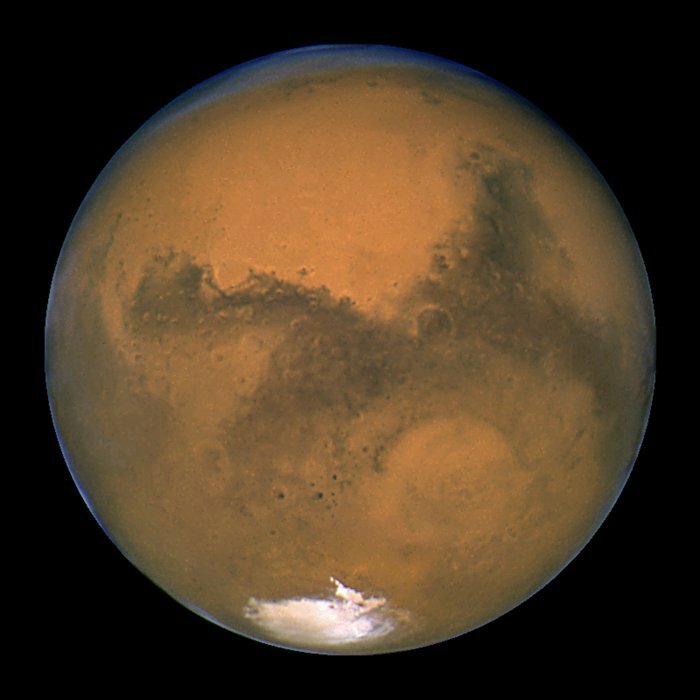 NASA/ESA Hubble Space Telescope snapped this portrait of Mars within minutes of the planet's closest approach to Earth in nearly 60,000 years. This image was made from a series of exposures taken between 5:35 a.m. and 6:20 a.m. EDT Aug. 27 with Hubble's Wide Field and Planetary Camera 2. In this picture, the red planet is 34,647,420 miles (55,757,930 km) from Earth. This sharp, natural-color view of Mars reveals several prominent Martian features, including the largest volcano in the solar system, Olympus Mons; a system of canyons called Valles Marineris; an immense dark marking called Solis Lacus; and the southern polar ice cap.